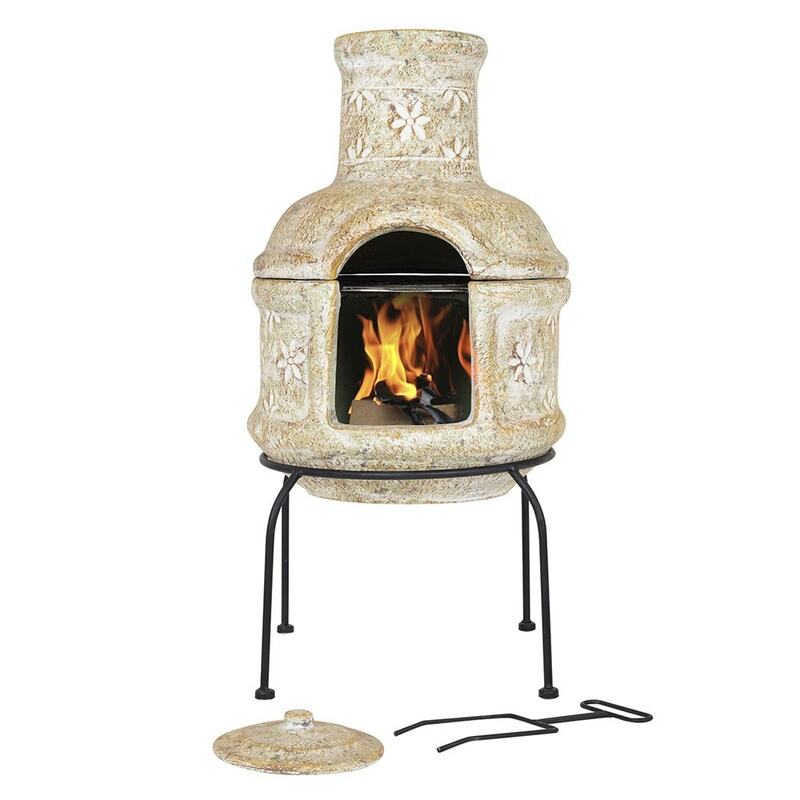 Buy Star flower small two piece grill chimenea: These two-piece chimineas offer the best of both worlds - a built-in grill letting you barbecue up a storm and a removable lid transforming it into a cosy wood fire.<br><br>Lift off the lid to reveal the grill, cook up a feast and replace it when everyone's fed to stay warm beside the glowing embers.<br><br>Made from rustic natural clay with a carved flower motif. Includes sturdy metal stand.<br><br>Measurements:<br>Ø36cm x H75cm<br><br><b>Warning</b><br>For outdoor use only. Keep children and pets away from the brazier when lit. Always position away from buildings on a safe non-flammable surface. If using on a paved patio, place on an additional protective paving stone made from solid natural stone or concrete at least 5cm thick. This will avoid possible discolouration and cracking of your patio, as some mock slabs made from resin or ceramic may be susceptible to heat damage. Only for use with logs. These two-piece chimineas offer the best of both worlds - a built-in grill letting you barbecue up a storm and a removable lid transforming it into a cosy wood fire. Lift off the lid to reveal the grill, cook up a feast and replace it when everyone's fed to stay warm beside the glowing embers. Made from rustic natural clay with a carved flower motif. Includes sturdy metal stand.